It’s been a crazy ride so far on the Love Kimchi train. We have learnt so much over the last couple of months. When we started Love Kimchi we had no idea how to run a food stall. It sounds stupid now but I suppose our thinking was, if you want to do something you have to jump into it with both feet. It has been a steep learning curve. We took far too much stock to Sheffield (60 DIY Kimchi Kits!) and Liverpool (3 boxes of containers!) but we are getting on top of it. Manchester was a well oiled machine in comparison. We unloaded, set up and were ready to go in 40 minutes and had room to walk around our side of the table which made a lovely change. All the festivals have been great fun, very hard work, but still great fun. And each one brings with it such a mix of emotions with a huge dose of exhaustion. I am still amazed by the first customers of the day that come to our stall. Willing to spend their hard earned money and put their trust in our Kimchi. Thank you very much. We couldn’t do it without your support. Our stall keeps improving with every event. For Sheffield, we had four types of Kimchi and a lot of DIY Kimchi Kits and not much else. 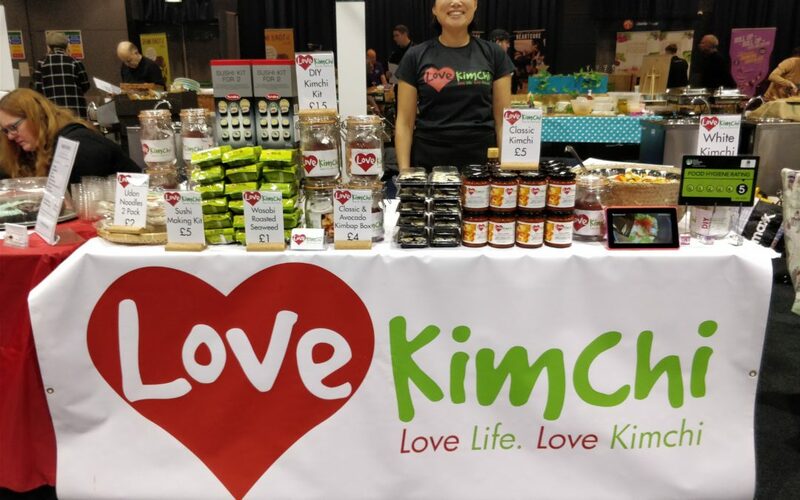 Since then we have added, Kimbap, Sushi Making Kits, Wasabi Roasted Seaweed and Udon Noodles and in Manchester last week we debuted our Classic Kimchi in jars (a whole blog post right there!) and a new Cucumber and Avocado Kimbap in a lovely new container. Last weekend at FarGo’s Vegan Festival in Coventry was our first hot food stall. We had Kimchi Fried Rice and Kimchi Quesadillas along with Kimchi Hot Dogs, Fried Korean Dumplings, Sweet and Sour Sausages and plenty of gorgeous Korean drinks to wash it all down with. We still had room for our Classic Kimchi (in jars) and as always our exclusive DIY Kimchi Kits. If you’ve never been to FarGo Village, you should definitely check it out. This weekend (21st April) we are at Leicester Vegan Festival in Leicester Athena. Really looking forward to it! See you there.